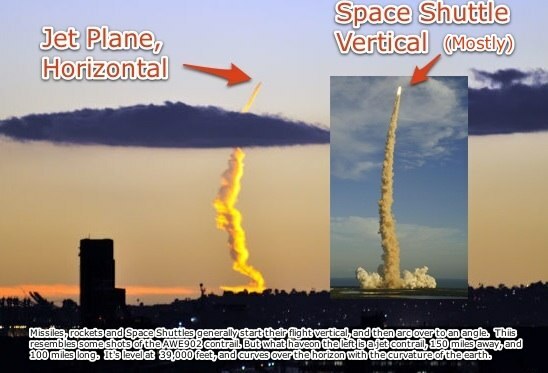 Of course if you watch a Space Shuttle launchyou’ll see it moves a lot faster than flight 902. An actual missile would be even faster. That alone is proof that it’s not a missile. Plus, the jet contrail is <i>narrower</i> at the base, where a missile contrail would be thicker. Looks nearly vertical, but you know it’s horizontal. The illusion is revealed to a degree when you look at the trail more from the side. Here’s another trail in the same place from Dec 31st, 2009, but viewed from up the coast in Santa Monica. Looks like it’s at an angle, but it’s still horizontal. Better, but there still an illusion here. The contrail is actually horizontal, from a jet in level flight at 37,000 feet, but it looks like it’s rising steeply towards the south. Again, the reason is perspective. The jet is flying at an angle towards the camera, so it looks like it’s rising up. Just like the power lines above. The illusion is particularly strong because there is no frame of reference, so you don’t get a sense that one end is closer than the other. With the power lines you see the perspective in the surrounding objects. With the 808 contrail, the contrail has also been spread out by the strong winds at 37,000 feet, so the back of the contrail (which vanishes over the horizon) is wider than the tip, which just serves to confuse the mind even more. The best way to visualize exactly what is going on here is to look at the track of flight 902 using Google Earth, which you can download for free in a couple of minutes. Go install it now if you’ve not done so already. Then download the track of flight USP902 on 11/08/2010. 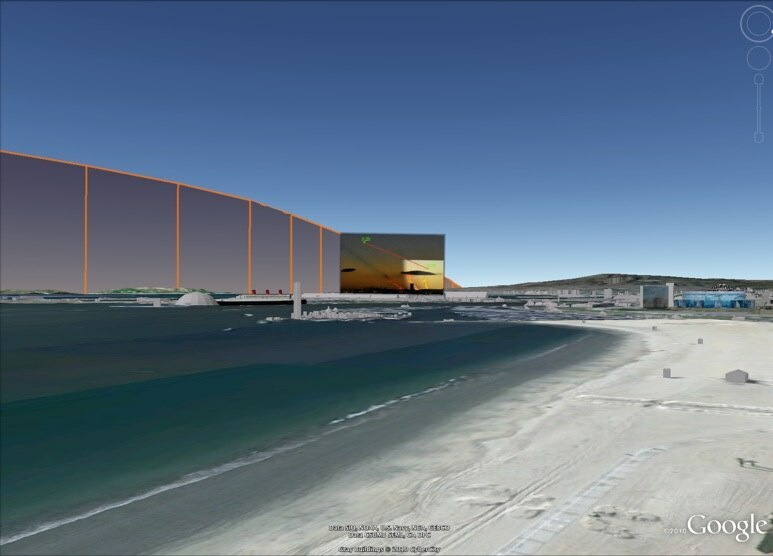 Visualize perspective and the curvature of the Earth. 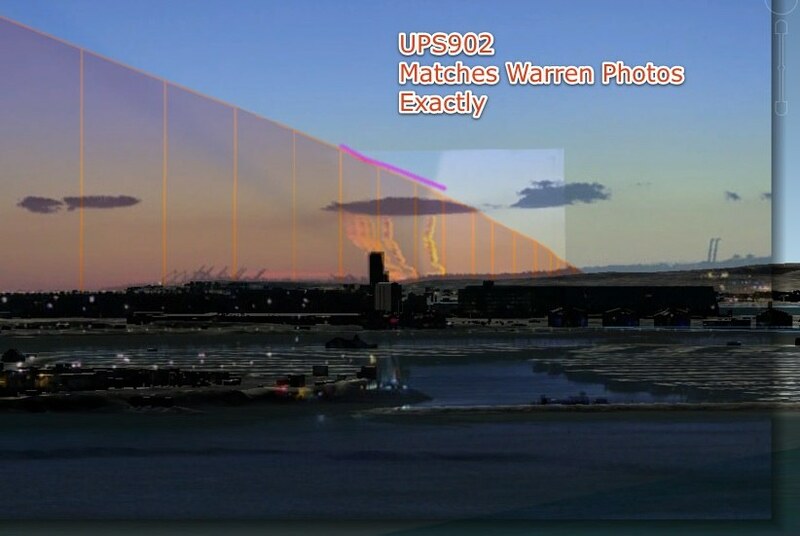 It shows the flight track (of both 902 and 808) from Hawaii to the US, then zooms in on Long Beach, and moves around to show the view that matches this composite photo. It’s not so clear in the video, but here in this image you can see the plane, leaving a short contrail, visible as four dark specks just above the cloud in the middle. That shows you the actual track of the plane, which matched the radar trace of 902. The astute observe will note that the contrail does not seem to match the direction of travel. That’s because it’s being blown to the south by strong (50 to 100 mph) winds at 37,000 feet. A plane’s movement through the air is often quite different to its ground track. It’s air speed would be about 500 mph, so if it’s flying at right angles to the wind direction, then its heading would have to be up to 11 degrees off its actual ground track (crabbing), and the contrail would be blown off the ground track by the same amount. This 5-10 degree angle between heading and contrail appears greatly magnified by the perspective. 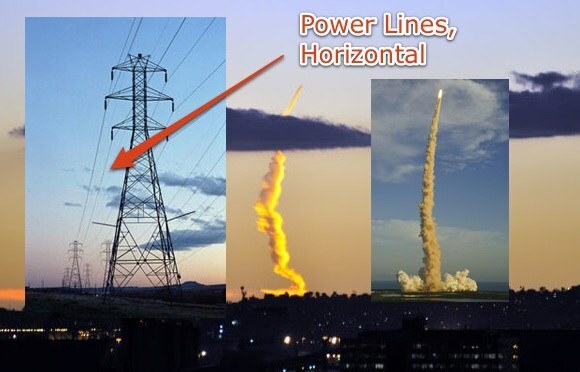 The video i showed you is an image of a vertical flight… making a cross with a horizontal line.. it is not a perception but OBVIOUS .. and you say the plane is level…. you are obviously crazy and use anything you can to try and persuade myself and any on lookers that it is in fact the other way around. 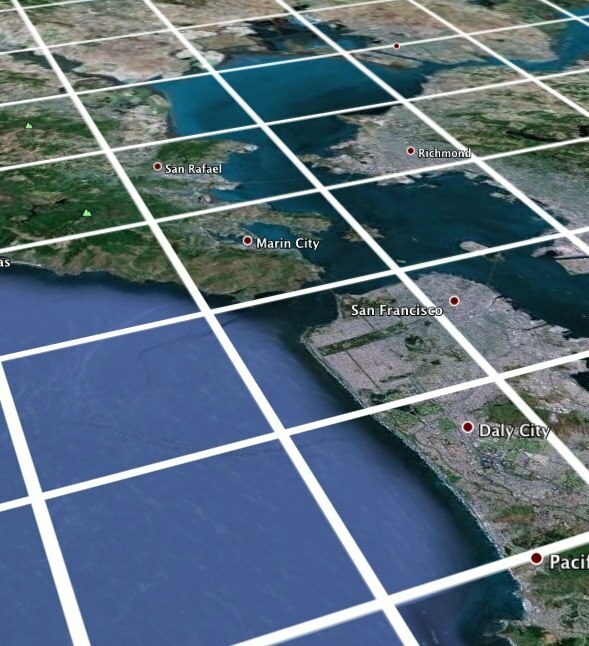 Here’s a perfectly horizontal grid of lines at 5 mile intervals, at 36,000 feet, above San Francisco, and the Golden Gate Bridge, viewed from space. Notice that even though all the lines are ALL perfectly horizontal, some look like they are going up in the air, and where they intersect, you get a cross. Spot on analysis, as usual. I commend your efforts in enlightening the masses. Fitch, do you call it crabbing when cruising, or just drift correction? Decent explanation, but why wasn’t there mention of the modes of surveillance and tracking of that area by our military and/or intelligence community? It would be important to let readers know that if in fact such a launch were a missile/weapon, what mechanisms would play in the detection and destruction of it from stateside. If it were a missile, why wasn’t an order given to intercept it? Thank you. N. Summers. 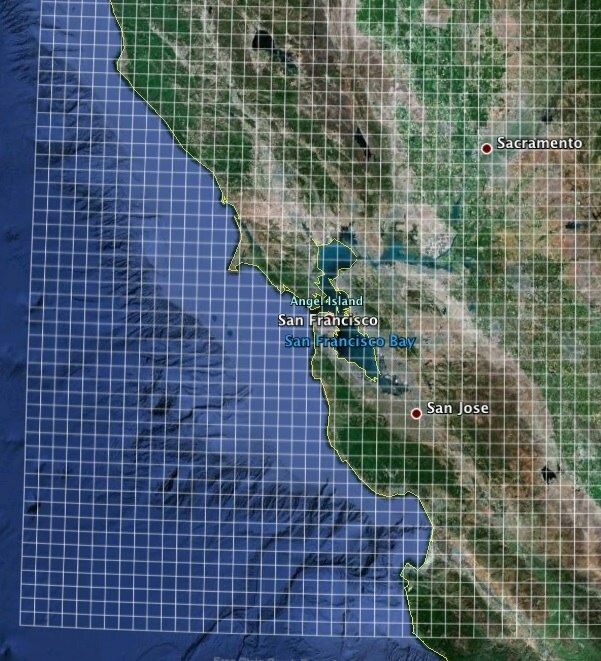 The entire area off the coast is tracked by FAA radar. Further out is the ADIZ, which is tracked by the FAA, and NORAD. All that was seen that day was normal air traffic. The likely plane, UPS902 was tracked as normal. No missiles were detected. Any informal discussion regarding the heading of the aircraft versus the track is referred to as crabbing regardless of altitude. Crabbing is not really something that we notice at altitude because , a) the ground is far away and b) wind correction angles decrease with increases in airspeed. 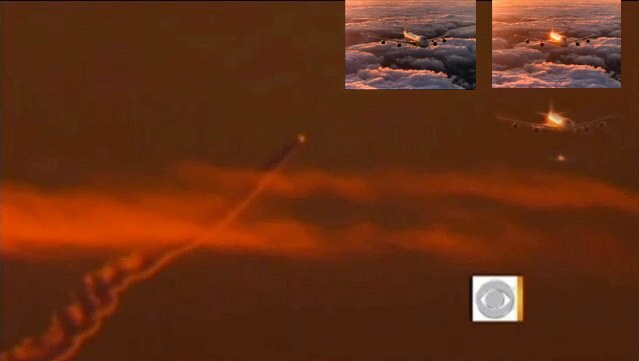 I think the one thing that prevented most people from seeing the supposed “missile” trail as what it was (a jet contrail, almost certainly from flight UPS902 from Hawaii), was the illusion that it looked like it was going straight up. So were the visible flames shooting out from the rear of the missile just illusions, too, or were they just sunlight refracting off of swamp gas? Critique the actual video footage, not just the still images. The video with visible flames coming from the aft section of this vehicle says it all. If this is a routine airplane flight, why aren’t Californians witnessing this phenomenon every day? “visible flames shooting out from the rear of the missile”? I’m afraid all I see is a flickering light source for a few seconds of the video. This was the biggest, brightest and clearest image I could find. Please let me know if there’s a better one. So based on approximate one pixel of information, it’s impossible to tell what that light source is. I think most likely it’s the sun reflecting off some surface of the plane. We don’t see this every day as the conditions need to be just right for such a long contrail to form and persist and spread like that. It does happen at least once or twice a year though. There was a smaller version of it the next day, and a near identical trail on Dec 31st, 2009. I also posted several examples from around the country. It’s unusual, sure, but not THAT unusual. 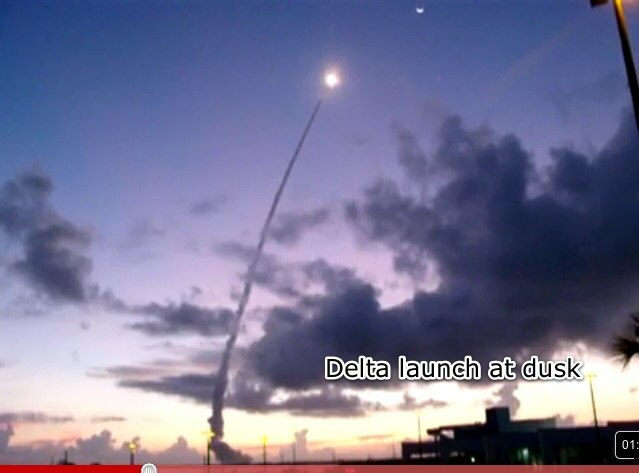 And have a look at an actual missile launch, and tell me it’s the same. This thing is barely moving. Note that the trail of the rocket launch actually gets MORE sunlit as it rises. Regardless- how can you argue with the discepency in speeds. 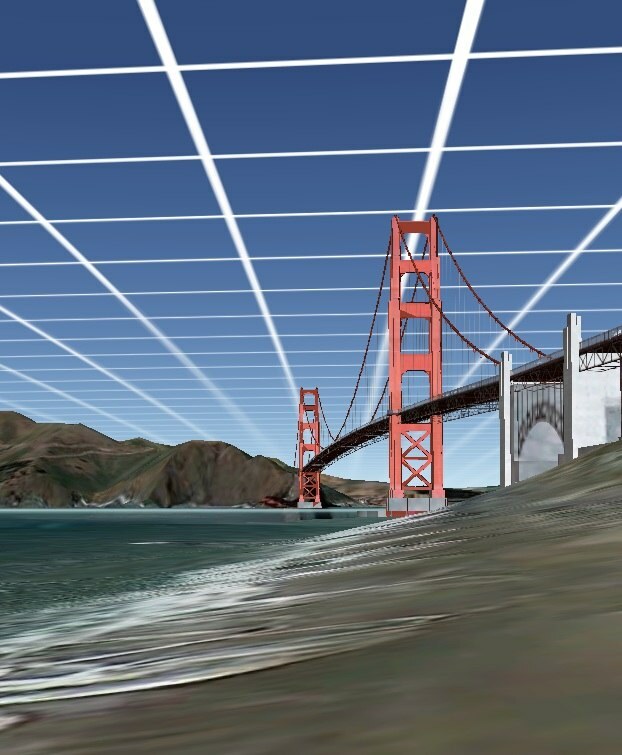 I assume that is GPS coordinates….could you convert that into lat/long? That appears to be between 130-140 miles away from LA shore. That is difficult to reconcile with the azimuth of the aircraft in the photo, don’t you think? I got it from a posting of yours on FR…. Load the kml in. Under “Markers”, there’s a white marker at 5:19, at that location. Turn it on, then go to “Rick Combo Photo”. It’s within a minute (which is the resolution of the various time stamps). Just measures the azimuth of the top of the 5:19 contrail. It’s 2 degrees above the horizon. And I don’t post of Free Republic, that was Liem. Must have copied down the wrong numbers. Apparently the high zoom level of the photo. From Rick’s location the eyeball azimuth appears not nearly as great as it does in the enlarged photo. Who are you ? I have been a little obsessed with trying to shed some light to these people who believe in chemtrails. It started with my brother who believes in a lot of conspiracy theories, he hit me with chemtrails and weather happened to be an obsession of mine , he thought there was no way I could prove him wrong and I did…….took me two years, but I finally convinced him that it is nothing but ice crystals, and once you understand it , its obvious what is true . Have you had any success with people ? because most people are so hard headed that believe this, its impossible to get through to them. Personally , after studying this aspect of the atmosphere , It amazes me what you can tell from contrails , after watching them as long as I have , I can predict when a trail will start and stop by looking at the cirrus around it , I have never seen something that made so much sense in my life and for people not to see what is true here I just can’t understand it. If you see a man driving a car with smoke out of his exhaust may you believe your eyes and tell him he needs a new exhaust…. or must you look at the possibility that it might of just been the angle you were looking at it and the atmospheric conditions or they type of engine he has. its just water vapour. Hows about i run a pipe into my backbox of my exaust.. attach it to an aerosol can of aluminium nanoparticles with strontium and barium in the mix… inject the mixture with a syringe type device into my back box… and drive past your housing estate! Dont pass comment mind.. or ill call you a NUTTY conspiracy theorist. And ill tell you that sunlight is NOT important for vitamin D that it DOES NOT help absorb calcium from food and that FLOURIDE in tap water is good for you and DOES NOT accumulate in the pineal gland and that you shoud RUB IN SOME MORE SUN SCREEN that DOES NOT contain aluminium nanoparticles because uv is BAD for you and the planet is WARMING not cooling and its got nothing to do with hotspots in the sun or clouds from aeroplanes. And i might just grow a nose like PINNOCHIO!!! So where are these spraying apparatus’ on planes? Where are the tanks of barium or strontium that can be injected into the exhaust? Where is the piping, the people delivering and loading it onto the aircraft?? Where is the pilot’s weight and balance figures that he has to recalculate after it is all sprayed? Heck where is a single sample of a “chemtrail” showing any of this stuff exists in the first place?? This page suggests such a phenomenon should be attributed to misinterpretation of the viewer – which may well be correct. But if someone did prove beyond any doubt that a trail was vertical, what would this mean? It would mean the plane was flying vertically. So it was either a fighter jet, or a rocket. 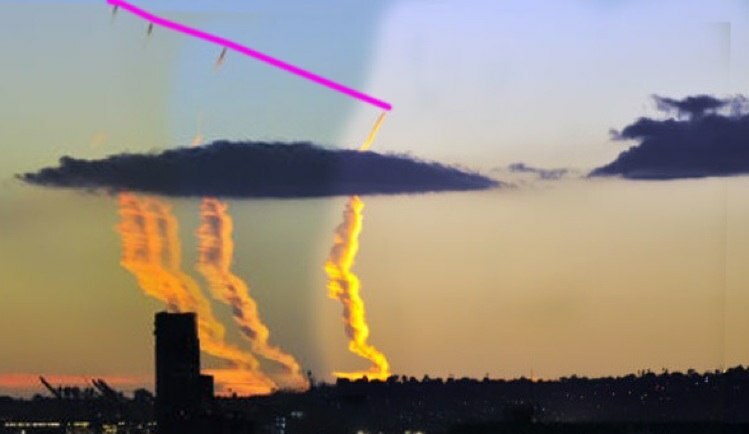 Most likely a rocket, as a fighter jet would only make a very short portion of a vertical contrail very high in the sky, and it would generally be accompanied by horizontal contrails. It’s VERY rare to see a contrail that is actually vertical. However it’s very common to see one that LOOKS vertical, but is actually horizontal.